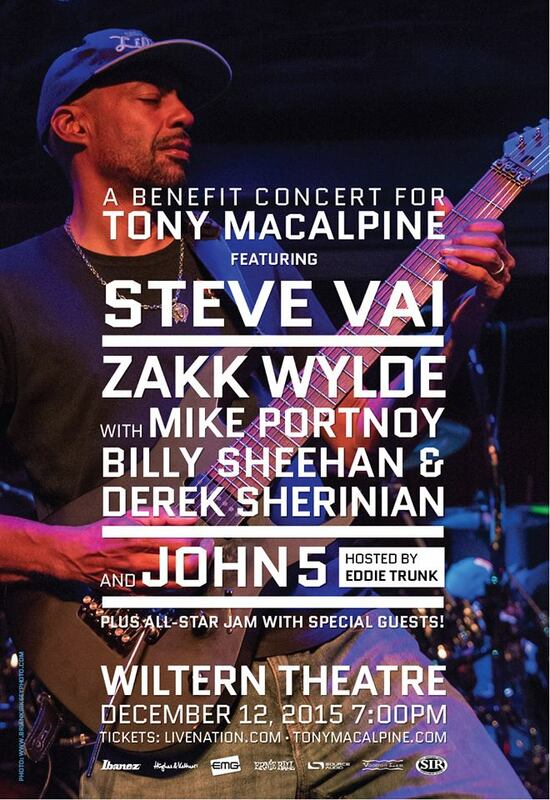 Steve Vai, Zakk Wylde, Mike Portnoy, bass icon Billy Sheehan and Derek Sherinian and many more will perform at a benefit concert for guitar and keyboard virtuoso Tony MacAlpine, who was recently diagnosed with colon cancer. In addition to his long, successful solo career, Tony has also been part of several rock super groups including Planet X with Derek Sherinian and Virgil Donati; PSMS (Portnoy/Sheehan/MacAlpine/Sherinian); as well as the Grammy nominated CAB with bassist Bunny Brunel and drummer Dennis Chambers. MacAlpine also spent seven years playing guitar and keys in Steve Vai‘s touring band. This past summer, Tony toured the US to promote his newest erlease (Concrete Gardens), but was forced to cancel shows in Asia, Australia and Europe. The benefit concert will take place at the Wiltern Theater on December 12, 2015, (Doors will be at 7PM with the show time around 8PM – tickets on sale this Saturday, November 7, via LIVE NATION), featuring performances from John 5 & The Creatures, Zakk Wylde with Mike Portnoy, Billy Sheehan and Derek Sherinian, Steve Vai and his band and will conclude with an all-star jam including Portnoy, Sheehan, Sherinian, and special guests. Eddie Trunk will serve as master of ceremonies for the night. Steve Vai, John 5, Paul Gilbert and Joe Satriani will donate personal guitars for auction during the event. Raffles will also be held Tony’s by gear manufacturers: Ibanez, Hughes & Kettner, EMG, Ernie Ball, Source Audio and Voodoo Lab. Tickets for the WILTERN are on sale Saturday November 7 at 10am PT through LiveNation.com, with all proceeds going to help Tony and his family. A GoFundMe campaign is in the works for fans who can’t make the show, but still want to help Tony.